Legend has it that in 1992, a young physicist named Philip Rosedale read Neal Stephenson's Snow Crash and was inspired to invent Second Life. Rosedale denies this, saying he had sketches for his virtual world and its "grid" populated with "residents" before Stephenson published his book featuring the "Metaverse" and the "Street." We know this much is true: tens of thousands of tech-savvy mugwumps and marginals read the book and played the game, and quickly implemented a creative and collaborative virtual reality wholly unlike anything seen before. The next generation of virtual worlds and games designers is sitting in classes right now. These classes have titles like Digital Games Design, Computer Games Programming, and History of Computer Game Design. What comics would you give them to read? Could something inspire them like Stephenson's Snow Crash inspired Second Lifers, if not its creator? This was the question presented to me by the organizers of the Virtual Worlds Best Practices in Education conference, held in Second Life at the end of March. Now, I'm not one to say "no" to a comics-related challenge, but I was a little bit stumped! I thought of Marvel Entertainments' previously failed attempt to launch a game. This month, Marvel and Gazillion Entertainment announced a partnership that promises to launch an online game in 2010. It will be a massively-multiplayer online role playing game (MMORPG) for kids based on Marvel's Super Hero Squad. DC Universe Online, another MMORPG developed in partnership with Sony Entertainment Group, is also scheduled for release in 2010. But these are already in development. We're teaching the up-and-coming generation of designers, who are already tinkering, experimenting, and planning. Perhaps they are the "marginal and dispossessed, the outsiders to the mainstream," like the ones who read Stephenson's Snow Crash, and then flocked to Second Life, using its tools to build a dizzying array of environments. This generation is capable of transforming the underlying logic of the worlds in which we interact, going far beyond the games already online or on the shelf. As always when I'm in a quandary, I went to my local comics shop, Mile High Comics. The staff there is friendly and funny, and they're wicked smart. I presented the question, and with head-spinning speed, staffers David and Kevin zeroed in on the core issues. First, not just any comic will do. For example, Y: The Last Man is a highly acclaimed comic, but likely to make a boring game. Games need multiple challenges that involve multiple players, and must allow those players to set the pace of the action to any speed they like. Second, the comics must include subcultures with subplots. MMORPGs are multidimensional, and appeal to different users for different reasons. Sure, lots of users play the game in order to duel and achieve objectives. But many other subcultures appear in these virtual worlds. Whole communities are built, creating economy, culture, and society. For example, World of Warcraft players have been building settlements and supply chains, and generating wealth (apparently by exploiting the needs of the more traditional, warring players). The point, as David and Kevin realized in seconds flat, is that a comic must inspire games developers to create their own worlds. It must contain multifaceted plot potential that allows for a high degree of user intervention. It must be malleable, and open to unexpected developments. And it has to be exciting, action-packed and challenging. Our job is to recommend comics that will show students how others have done it. Here is our short list of eight recommendations. We all agreed that if it hadn't been J.D. 's day off, the list would have been longer. David and Kevin routinely display pure genius at the drop of a hat, but J.D. is the games expert. You may have to check back for additions to this list. While very similar to the generic conventions of the Marvel and DC universes, Heroes finds its superheroes among the ranks of ordinary individuals, allowing for a theoretically unlimited supply of creative possibilities without being burdened by origin stories or tropes about heroic isolation. The series combines short and smart story arcs with a larger, more mysterious puzzle, leading to adventure, guess-work, strategy, and a high level of emotional engagement. Like Heroes, Powers offers seemingly endless possibilities for the discovery of the super or extraordinary within the ordinary. 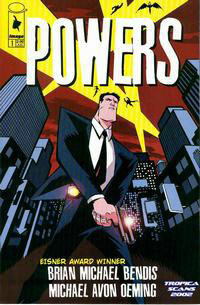 It also relies heavily on secrets, entanglements, mystery, danger, and a secret cadre of intergalactic guardians. Any well-told story that advances the potential of multiple worlds would be most welcome for a class project in digital games design. What would it be like to be a cop in Neopolis, where even the pets have superpowers? Games set in densely-populated cities with unpredictable behavior from even the smallest resident presents dazzling creative opportunities. The multiplicity of characters and points of view in Astro City are a treasure chest for the games designer, as are the remarkable character designs of Alex Ross, and the unusual attention given to Astro City's physical features. The anthology approach of the narrative also recommends itself to MMORPG design, offering far greater flexibility than small story arc-large story arc dynamic, which must resolve itself at some point. The world of the Mouse Guard is another excellent example of a potentially infinite story, and the art is exceptional, evoking gasps from many who see it for the first time. 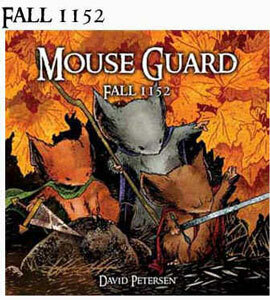 Mouse Guard is extraordinary in both color and detail, and would be particularly appealing to those designers with a predilection for the medieval or pre-industrial age. A phenomenal fish-out-of-water story that challenges the reader to imagine how characters accustomed to one set of moral, physical, and natural rules would function when banished to another, more limited and more dangerous world. Fables has the added benefit of providing multiple examples of genre using the same world and characters, such as the murder mystery, the conspiracy thriller, and the caper. CrossGen unfortunately went bankrupt in 2004, but not before presenting a tantalizing picture of a universe filled with planets, each with their own stories. Over time, certain magical signs become portals, through which the stories of the different planets begin overlapping, changing the dynamics of the stories in unpredictable and uncontrollable ways. Some special individuals are able to travel from planet to planet, and begin to acquire powers that give them ever more authority over the basic realities of different planets. Does this not sound like a spectacular basis for a MMORPG? Artesia is another great choice for students with an interest in feudal Europe. 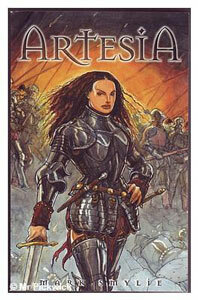 It has a well-crafted mix of intrigue, politics, mythology and history, and is known for its strong female characters. As a further benefit, Artesia's creator Mark Smylie has already begun development of an RPG called Artesia: Adventures in the Known World. This would provide students with an excellent basis for critique, and a blueprint for getting started in creating their own virtual world and the games that could be played within it. 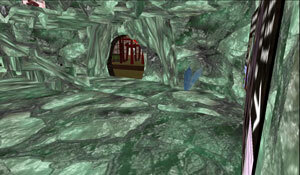 Using a slightly different model, students could play SLEEK – The Game, an MMORPG currently taking place in Second Life. SLEEK uses a comic book to launch each phase of the game, tightly integrating the game with the comic. The rules of play are drawn from the underlying logic of the Second Life application. On a side note, during my visit to Mile High Comics, manager David Saindon did something no one else has managed to do: he turned me onto Neil Gaiman. He convinced me to read Smoke and Mirrors, and by the time I'd finished the introduction, I was hooked. A few of the short stories collected in Smoke and Mirrors, especially Murder Mysteries and Chivalry, are great examples of how to imagine a world that is just like ours, only not quite. 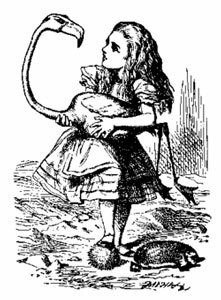 Of course, if we're going to go from comics to prose, the obvious choice for alternative realities is the classic choice: Lewis Carroll's Alice's Adventures in Wonderland, and Through the Looking Glass and What Alice Found There. Sometimes, the standard challenges (survive, kill or be killed, or collect more powers) pale in comparison to the most basic challenge of all: to figure out what the hell is going on, just so you can go home.